Special Containment Procedures: The SCP-456 colony is to be kept in a sealed containment room. Personnel entering the containment area should wear Level 1 biohazard suits to avoid being bitten by SCP-456, and the suits must be treated with insecticide upon leaving the enclosure. When not being used in experiments, SCP-456 must be fed 70 ml of human or animal blood per 100 insects, weekly. Description: SCP-456 is a variety of the common bedbug (Cimex lectularius). In addition to an anticoagulant, SCP-456 injects [DATA EXPUNGED] when biting its host, causing the brain to produce adenosine, endorphins, and a narcotic identified as an analogue of fentanyl. As a result, victims of SCP-456 infestations experience increasing euphoria and somnolence as the number of insects increases, eventually sleeping 24 hours/day. SCP-456 was identified after a number of individuals were found dead in their homes, suffering from varying degrees of malnutrition, blood loss, and narcotics toxicity. SCP-456 continues to be a problem in the wild. 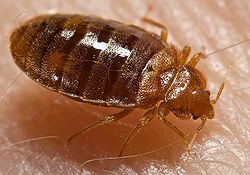 To reduce the number of infestations, the CDC has issued a false report that bedbugs carry malaria and must be exterminated when found. Experiment 456-1: D-17514 exposed to SCP-456 and fed standard rations, but given no other special treatment. After 17 days of exposure, D-17514 slept constantly and was unable to care for himself. Subject expired from malnutrition █ days later. Experiment 456-2: D-17515 exposed to SCP-456 and fed intravenously when unable to care for herself. Subject expired from blood loss after ██ days. Experiment 456-4: D-17517 exposed to SCP-456, fed intravenously, and given periodic blood transfusions in addition to small doses of a narcotic antagonist. Subject survived for ███ days, and was supporting a colony of ██████ insects at conclusion of experiment. D-17517 remanded for amnestic treatment and reassignment on █/██/20██. Addendum: Mobile Task Force Iota-10 ("Damn Feds") is investigating a report that a drug cartel located in ██████████, Mexico, is kidnapping members of the public, breeding SCP-456, and extracting the narcotics produced by the victims under the cover of DEA operatives. Anyone found to be using SCP-456 in this manner is to be terminated.